My love affair with birds started when I was a very young child. I bred and raised parakeets and cockatiels as a kid. 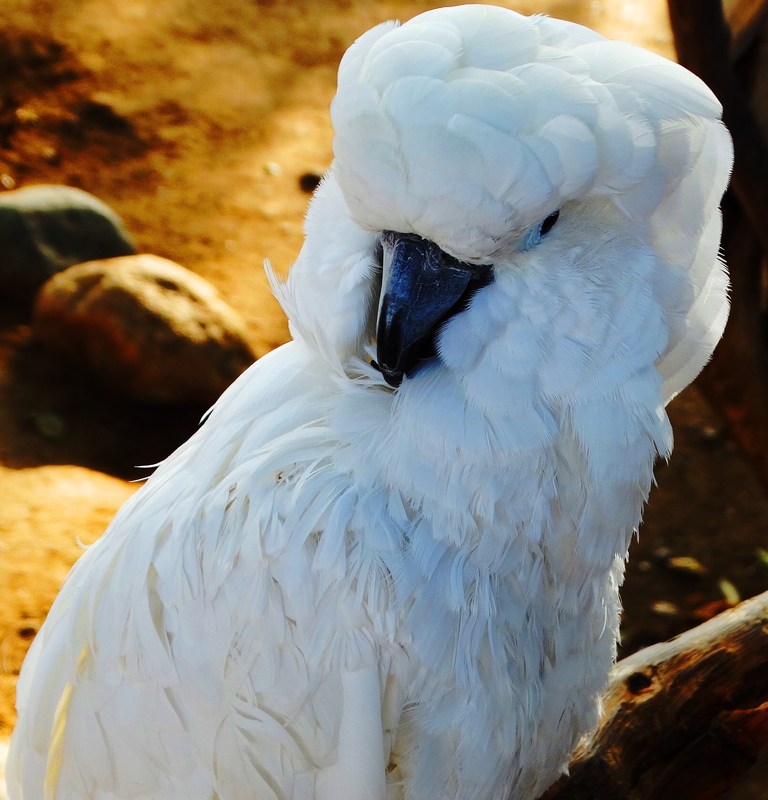 I had two egrets, one pigeon, two cockatiels, and one great blue heron find me at picnics or hikes or at home, who I adopted and raised at various points in my life. I talk to birds wherever I am and they tend to talk back. You should try it. I highly recommend it. Birds just make me happy. Always have and I find more and more now that I am retired, that the things that made me happy as a kid, still make me happy as an adult, and once again now, I have time for them! 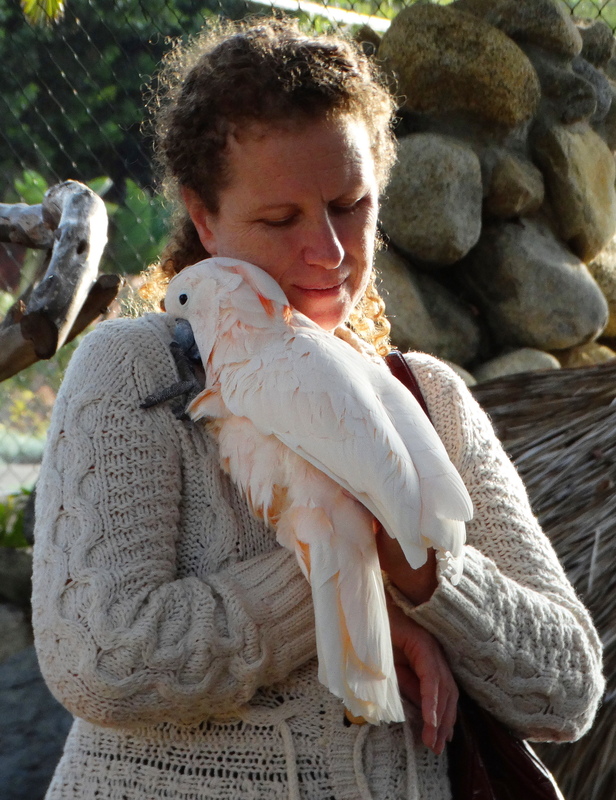 I cannot however adopt a bird until I stop traveling, so I get my bird fix these days by hanging out with the wild Holler birds, and visiting people who rescue birds. 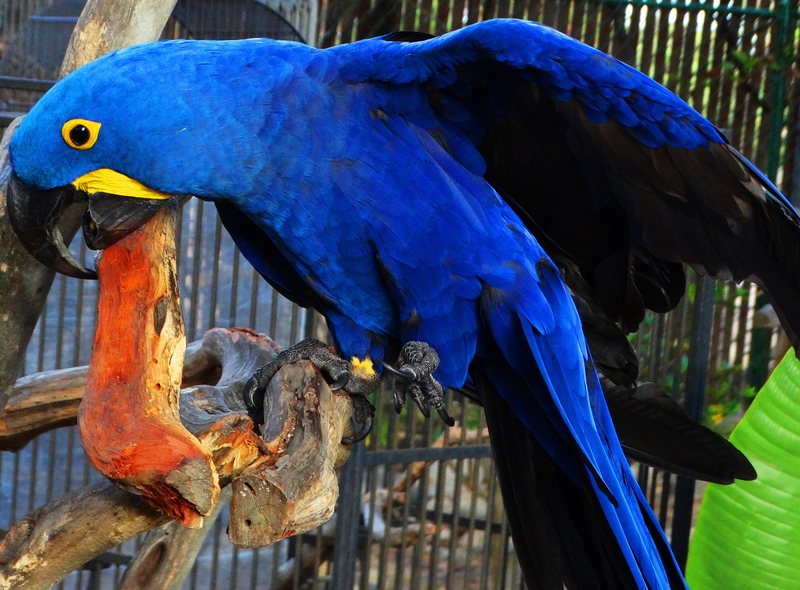 Check out the birds at Free Flight Exotic Bird Sanctuary. 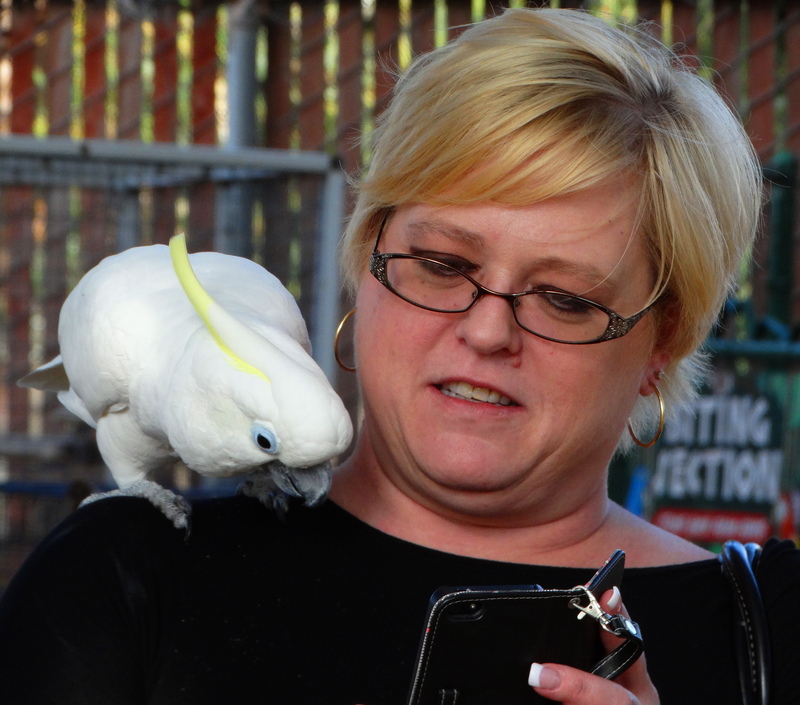 Free flight was started by a veternarian who loved birds. He built the facility next to his veterinary hospital that of course treats birds. 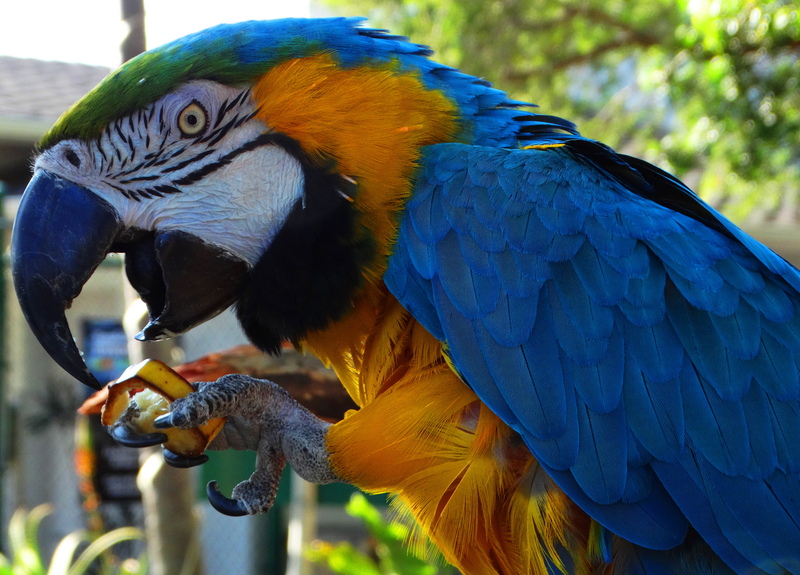 Free flight is a non-profit that accepts birds with special problems and houses them in a natural tropical setting, where birds are kept in open air perchs with other flock members as they are in the wild. 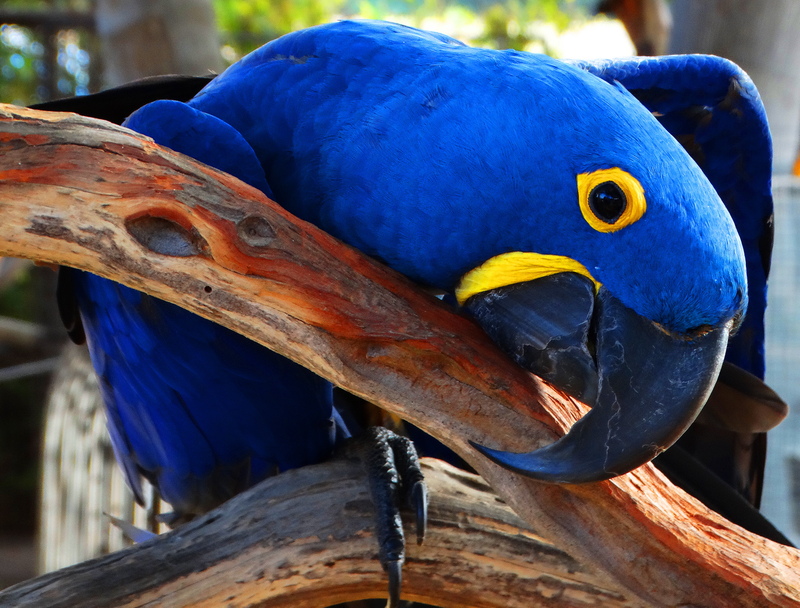 The results are magical, for the birds and for people who are encouraged to visit and interact with the birds. 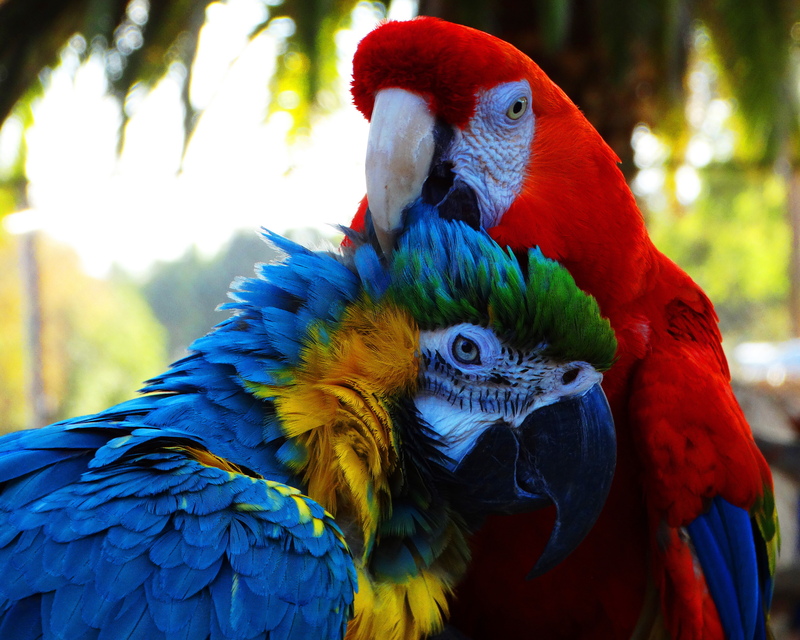 People leave this place in love with birds! You can see it happening right before your eyes, when the bird decides to hop on them. 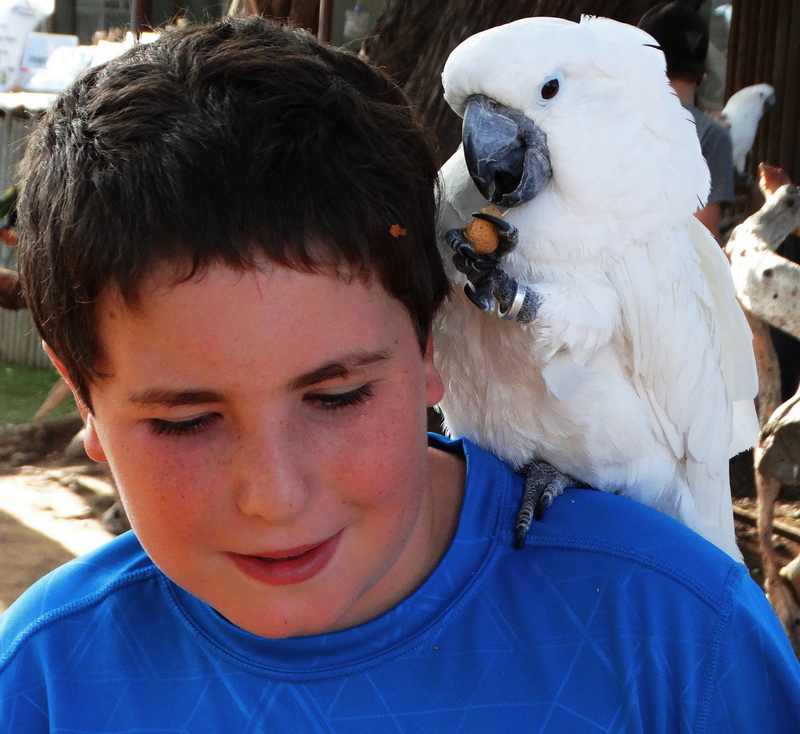 The helpful cockatoo got me a better photo by thoughtfully removing this boys hat. I didn’t even have to ask him! Smart chirper. This one had strong preferences for certain tunes on this woman’s i pod and danced in approval when she picked the ones he liked. 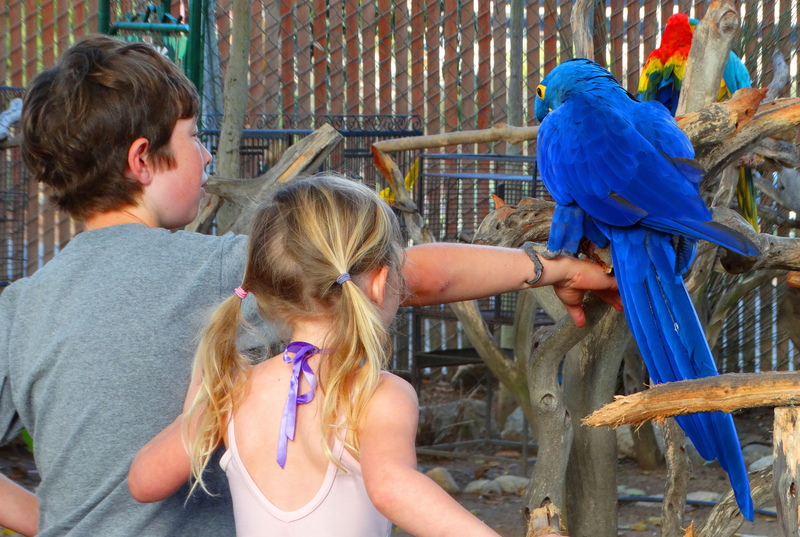 Big brother was quite brave and showed his little sister how to handle a big bird! 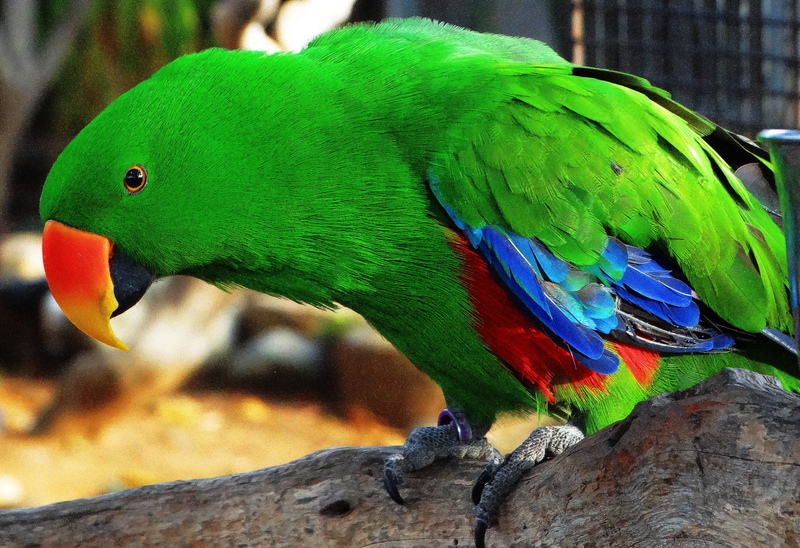 The staff thought this eclectus might enjoy calling The Holler home. The only hard part is walking away. 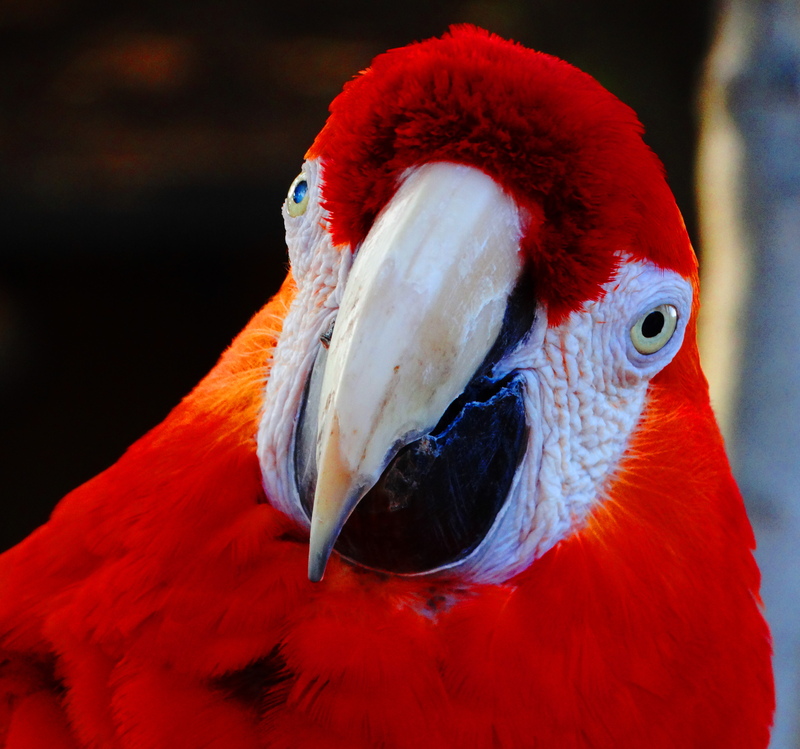 We have room for free flight aviaries at The Holler, so someday….. 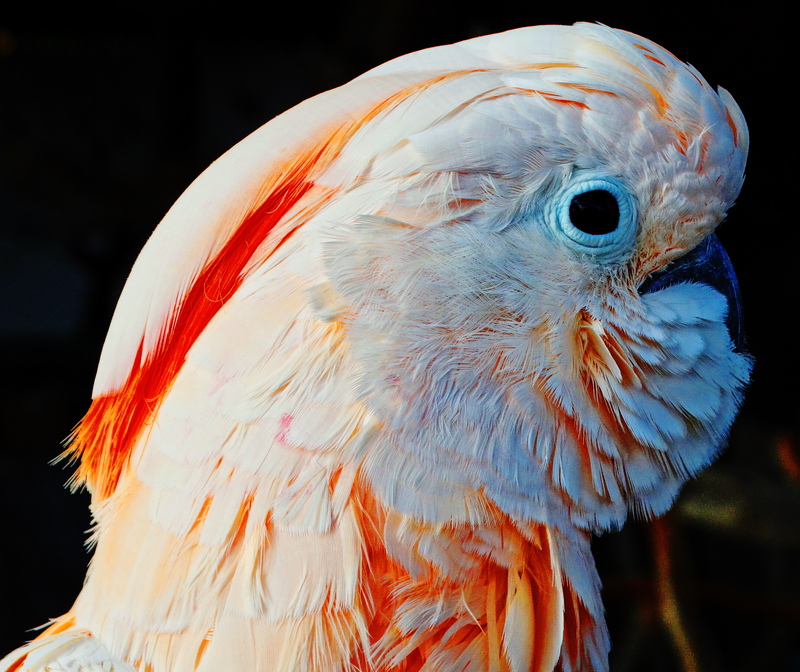 I might be able to breed some birds that are critically endangered in the wild.